Jay’s research investigates how both emerging and existing low-carbon materials can be implemented in the built environment and if scaled, what impacts these materials would have on reducing the lifecycle emissions of buildings. Envisioning a built environment that is both low-carbon emitting and carbon storing, Jay’s goal is to change the materials that we use in designing, building and retrofitting buildings. Jay’s professional experience includes being a structural designer in Colorado, and as a project manager for rural construction projects in Bolivia and Eswatini. While serving on the Structural Engineering Institute’s Sustainability Committee and as a member of the Embodied Carbon Network, Jay works to develop tangible actions that structural engineers and building designers can take to reduce the carbon emissions of the structures they design. 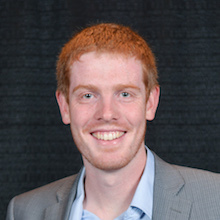 Jay Arehart is currently a PhD student in architectural engineering at the University of Colorado Boulder. Jay also received his BS and MS degrees at CU Boulder where he studied structural engineering, sustainable building design, and novel infrastructure materials.